In 1979, a year after its extraordinary CBX six-cylinder, Honda again took top honors with another spectacular big bike, the CB900F. 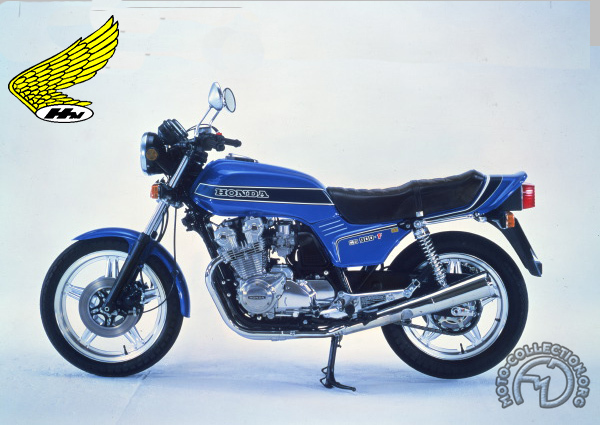 Destined to succeed the legendary CB750 Four, the 900 was produced with great care. Like most of the significant new Hondas of the period, the CB900F was designed under the leadership of the highly creative Soichiro Irimajiri. Behind its conventional exterior, the 900 concealed a number of innovative technical solutions: four-valve heads, constant-vacuum carburetors, electronic ignition, removable cradle elements, hydraulically adjustable suspension, built-up wheels. The powerful (95 hp at 9000 rpm) four-cylinder engine outclassed its rivals and provided the Bol d'Or with a spectacular performance for its day, with a top speed close to 135 mph and a 12.5 second standing quarter. Fast and furious, the Honda was more of a grand tourer than a true sports bike. The 300 Bol d'Or was heavy (over 550 lb ready to roll), not particularly agile and lacking in precision at high speeds. It reacted poorly to strong-arm driving methods. As its appearance revealed, it was more at home on a high-speed highway where its rider could appreciate its long stride, the flexibility of its engine, the natural riding position and the comfort of the suspension. Multi-purpose and capable of adapting to all kinds of use, the CB900 Bol d'Or enjoyed great worldwide success. It was the natural heir to the CB750. Thanks to its 95 hp 16-valve engine, the CB900F Bol d 'Or was an excellent sporting mount with a lively highway performance.